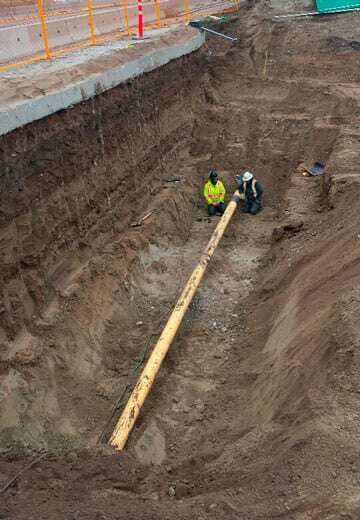 [We were] contracted to install … 35 miles of 20” steel pipeline [in] Pennsylvania. As part of the project, the pipeline had to be installed on a 35 [degree] slope approximately 900 feet in length… The GSI crew arrived on project ready to go to work. The entire crew made safety the top priority and was a pleasure to work with. They installed the required stabilization in a very professional and timely matter and our client and I was very pleased with the results. I will not hesitate to employ GSI on future projects. Two sites along a Provincial highway in southern British Columbia required excavation at the roadway’s edge to expose a gas pipeline 5 meters below the roadway elevation.